Argentina and the Netherlands are set to lock horns at 4am Thursday for a spot at the Maracana Stadium and a shot at immortality. SAO PAULO: The fun-loving, fleet-footed team in orange has formally donned the black hat. One of its top players falls down more than a Hollywood stunt man with vertigo. Its coach acts as though he's the smartest man in every room (and he very well might be). 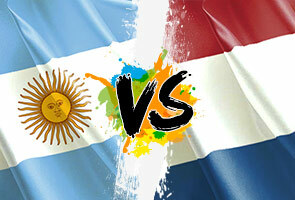 And the Netherlands has already ousted two plucky underdogs — fan favorites Mexico and Costa Rica — from the tournament. No, the Dutch team might not win many popularity contests at this World Cup, but the Oranje might finally have the squad capable of winning the sport's biggest title. "We have to be a bit lucky," Netherlands Coach Louis van Gaal said Tuesday. "The coin has to face your way, as we say in Dutch." They'll need more than luck on their side in Wednesday's semifinal, where they'll face Lionel Messi, his talented Argentina team and what promises to be a loud contingent of fans swathed in light blue. The Netherlands is accustomed to being the team with rousing crowd support. Once a highly likable bunch with an impressive football history — "Total Football," Johan Cruyff and those splashy orange kits — it has evolved into a villain of sorts, noted for van Gaal's petulance, Arjen Robben's dives and thuggish play in the 2010 World Cup final that prompted nine yellow cards. The Netherlands is aiming for not only a return trip to the finals but hoping to overcome some troubling history. The Dutch have settled for second-place finishes at the World Cup in 1974, '78 and 2010, and are still looking for their first title. One key against Argentina could be the play of Robin van Persie, who was unable to practice alongside his teammates Tuesday. Van Gaal said his star player was battling a stomach ailment and wouldn't speculate on his status for Wednesday's game. The team captain was sent to the bench late in the team's 2-1 win over Mexico in the round of 16 on June 29, and at the Netherlands' practice session Tuesday, reporters spotted the star player and coach exchanging words. "You seemed to be annoyed when you talked with him," a reporter said to van Gaal later. "No, no," the coach responded. "I'm always really nice." Though he's already pulled van Persie once this tournament — and the Manchester United Star also missed the Netherlands' third match after picking up two yellow cards — van Gaal seemed to indicate he was hopeful whatever ailed van Persie on Tuesday would pass quickly. "In principle, my captain will always play," van Gaal said. "Of course, they have to be in good shape." Dutch media members know that now is a difficult time to second-guess the coach. Seemingly every decision he's made in this tournament has helped propel the Oranje forward. He's used the same lineup just twice. In its past three games, the team has tallied four goals; three have come from van Gaal's second-half substitutes. In a 3-2 win over Australia in the group stage, he sent in 20-year old Memphis Depay, who notched an assist on the goal that tied the game and then scored the game-winner. Then against Mexico, van Gaal gambled again, replacing van Persie with Klaas-Jan Huntelaar. The Dutch striker set up Wesley Sneijder's equalizer in the 88th minute and then scored the game-winner two minutes later on a penalty kick. Van Gaal is also responsible for perhaps the most surprising personnel move in a tournament that's been packed with drama. Tim Krul, the team's backup goalkeeper, hadn't set foot on the pitch during this World Cup — not until time was close to expiring in the Netherlands' quarterfinal matchup against Costa Rica. With penalty kicks about to settle a 0-0 game, Van Gaal yanked his starter, Jasper Cillessen, who'd just played 120 minutes without allowing a goal. "If you see their manager's face when I came on — he was looking over at our manager — his face was priceless," Krul said. "It was definitely one of those fantastic moves." All Krul did was block two Costa Rica tries and stamp his team's ticket into the semifinals. Cillessen will be back in goal against Argentina. "It will not affect my confidence," he said. The Netherlands will again rely heavily on Robben on Wednesday. For fans, he's one of the most exciting and infuriating players on the pitch. He's always around the ball, has a motor that doesn't stop — but also has a propensity for theatrical dives. Mexico coach Miguel Herrera called Robben a cheat following his team's loss. In the waning moments of stoppage time with the score tied at 1, Robben drew a late penalty — "an invented penalty," Herrera called it — and the Oranje won the match on the ensuing penalty kick. "Robben did three dives and he should have been cautioned," the Mexico coach said. "You should caution a guy who is trying to cheat." For his part, Robben offers few apologies for his rough-and-tumbling style of play. "In recent days there has been a lot of talk about diving," he told the Dutch broadcaster NOS. "Actually, I'm tired of this [expletive]." As for that Messi problem that Argentina presents, as with most things, van Gaal thinks he has the answer.